At OXXO this morning, the coffee was free. All I had to do was show my thumb. It’s not some thumbprint technology, it’s old school. 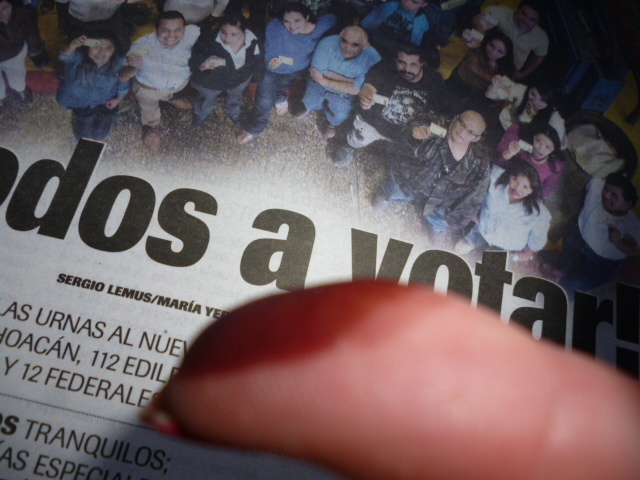 After Mexican voters cast their votes, their right thumbs are indelibly inked. You have to wonder what body part they’ll ink on a voter who has no hands. The voting process is old school, too. Dressing up a little better than usual, because you just never know whom you might run into at the polls, because this is an event that brings out everyone, well, everyone with an IFE card, I joined the line for first last names from Posada to the end of the alphabet, two ancianas passing ahead to the front of the line. I surrendered my voter ID to a poll worker, who passed it on to a man with tattooed arms, who read my name out loud. And he got it right, too. The next worker located a photo of my ID in a book containing the ID of everyone in the precinct, and a fourth separated ballots from four books: one for governor, one for presidente municipal, one for a federal diputado, and a fourth for the diputado local, each printed in distinctive colors. Entering the voting booths, curtained in plastic, I drew Xs over the names of my candidates, noting that the bravest and most independent of all was buried at the lower left hand corner, folding each ballot before exiting the booth. After depositing each ballot into its designated box, I returned to the table, retrieved my IFE card, and got inked. Voting in Mexico is a streamlined, easy process, no confusing machines to work or chads to confuse. And that’s the way voting ought to be. On my way out, I ran into a former governor. But then former governors and retired politicians are a dime a dozen around these parts. If you’re reading this, you’ll want to know whom I voted for. Let’s put it this way: the party who kept sending me spam texts didn’t get my vote, and neither did the party who kept robo-calling me. I picked up a t-shirt from one of my candidates months ago. And one of my candidates never gave me anything, never contacted me, not even leaving a single piece of paper slipped under my gate. But he brought Jorge Castañeda to town support his campaign, and that was good enough for me. I have a feeling that this election, like that last gubernatorial election, isn’t over yet.